Read how to fix "The Trusted Platform Module, which is used to secure your PIN on this device is not available right now" error in Windows 10, in this post. We all know that PIN in Windows 10 is backed by a Trusted Platform Module (TPM) chip, which is a secure crypto-processor that is designed to carry out cryptographic operations. Any changes in the TPM chip may directly affect PIN on your Windows 10 device. The Trusted Platform Module, which is used to secure your PIN on this device is not available right now. Sometimes it helps to try again or you can skip for now and do this later. Try to recreate your PIN. Microsoft says, PIN errors are transient in nature and may resolve themselves, without requiring further action from client side. If you’re getting this error while setting up or removing PIN and you can’t recreate PIN, first try suggestions mentioned in this fix. Then retry to recreate your PIN. 1. Press + R to open Run, type tpm.msc and click OK to open TPM Management snap-in. 2. 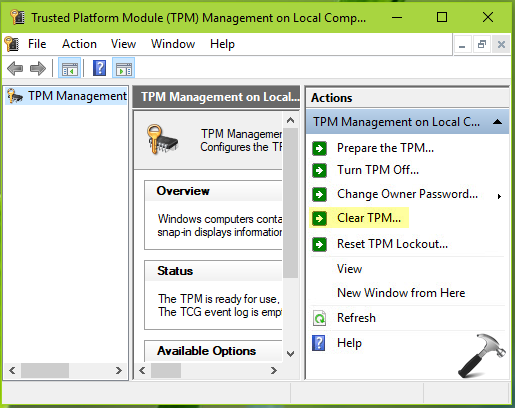 In TPM Management snap-in window, under Actions, click on Prepare the TPM option (refer screenshot below). If you’ve Prepare the TPM option greyed out, make sure TPM is enabled in BIOS. 3. Once the TPM is prepared, it should be readily available to manage your PIN and error will no longer appear. 4. In case, if issue still persists, open TPM Management snap-in and under Actions, click on Clear TPM option. Then click Restart and this will clear TPM on your machine. Disclaimer: Clearing the TPM may result data loss. All the created security keys that are linked to TPM, login PIN, encrypted data with BitLocker etc. may be erased, so make sure you backup these items before proceeding. We believe after trying above mentioned steps, the issue will be be fixed for you. [FIX] The Group Policy Client Service Failed The Logon. Access Is Denied.